Everyone knows that life beyond The Pod is possible. But they are trapped - each breth controlled by the Ministry. The Grove was rebels' chance of freedom. Now the Ministry has destroyed it and survivors must search for hope elsewhere. Alina lead the way to the only remaining Resistance base, Sequia. There she uncovers a radical plot that could wipe out the Pod...and all those in it. Together with Quinn, Alina must escape Sequoia and save the people they love. I've been anticipating Resist for a long time, especially since Breathe has a high-ranking place on my favourite books list. Sadly, though, I found myself disappointed when I started to read this book. 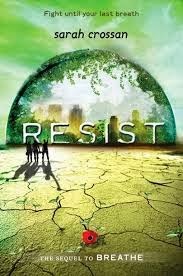 I'll begin by mentioning the cover; the green completely reflects the environment and what the Resistance is fighting for. Sadly though, the main focus - and heart - of the series was lost in this sequel, with the writing feeling forced at times. The romance, between Bea and Quinn, involved too many cliché lines for me personally, and I felt I lost my connection with them because of this. I really wanted to love this book, by sadly my expectations fell short. Resist is once again told from multiple narratives, this time adding a new character called Ronan into the mix. I adore this style of telling a novel, even so, I wish the main characters could have come-together more often and made choices regarding The Pod and Resistance. Crossan is able to, something that makes her a really talented writer, create four distinguishable characters with very different experiences despite living in the same world. Alina, Quinn and Bea, our three main protagonists that have followed us through from the first book have all grown, despite still being the people we first met at the beginning of Breathe. Alina is strong-willed, fighting for her right to Breathe and is undeniable loyal, something that is admirable in this heroine while Bea is intelligent, witty and has the strength to continue despite her parents' deaths. Despite not being the number one fan of the plot, no-matter what I was rooting for these characters. Quinn and Ronan have complicated story-lines in which their characters cross-paths which I would have definitely have liked to see become more in-depth. Whilst I struggled to immerse myself in this book during the first three parts, the final two were much stronger. Finally, I found heart-racing and fast-paced action, in which I found the style of Crossan's writing that I loved from the first-novel seeping through. There was a lot of tension built up in these closing one hundred pages, and I couldn't put the book down. Resist left me constantly wondering and waiting, I never did know for sure what would happen next! There were some loose-ends when it all came to an end; I can't help but question what happened to my favourite side-characters! Resist was much more mature than the initial book, something I wasn't expecting and found myself feeling slightly uncomfortable reading. So, as for the sequel, I do recommend it for slightly older readers, leaning towards 13+. Thank you to Bloomsbury for proving me with this copy in exchange for a review! How do you live by the rules if you don’t know what they are? A teenage girl wakes up with no memory of who she is or where she has come from. The only clues to her identity are a dead mobile phone in her pocket and a beautiful amber necklace around her neck. Suddenly, 'Amber' has a brand-new life, a brand-new name and a whole lot of questions. Disturbed by strange visions and powers, she struggles to understand the rules that everyone seems to know. How can Amber make sense of the person she seems to be? Does she even want to be that person anymore? From the gorgeous cover(Which I must admit is one of my favourites) to a captivating plot, Amber is a gem-stone of a novel! It has a perfect mix of genres: fantasy, contemporary and romance, with some time-travel thrown in, all coming together to make this un-putdownable. I will admit, while reading, there was a point where I thought I had over one-hundred pages left, but really there were only forty! I didn't leave this book long before picking it back up and continuing! Our main protagonist, a teenage girl who names herself Amber because of the necklace she finds around her neck after she wakes up with no recollection of who she is. Amber is plagued by strange visions and powers that feel so naturally yet, it comes to a point where she realises she must hide them. The way Sykes has written this allows us to get snippets, and small pieces of information handed to us, like she is constantly teasing the reader. This only made me become more intrigued; while also creating a balance of Amber finding a new-life, making new friends, and discovering herself. In many ways, being thrown into a situation you feel out-of-place in is something many young people can relate to. Although, Amber must do this, and find herself when she has no-idea who she is or what she might have done in the past. The writing is the book allowed time for each new setting to be given a detailed description, as well as match the voice of a teenage girl. It was completely creative, bringing new inventive ideas into a genre I have read many times, as well as throwing in a love-interest and 'villains' to make this plot even better. Amber was completely packed with suspense and surprises, the excitement is there throughout. I spent most of the weekend I read it in with my head buried in this book! This book has everything that I was expecting and more; an intriguing plot, a rule-breaking romance and hidden secrets bringing in the suspense. Definitely one that anyone will find an enjoyable read! Thank you to Amber from The Mile Long Bookshelf for my amazing new rating system! Thank you to Curious Fox for another review-copy as part of Team Fox! Amber sounds brilliant, I'm really glad you enjoyed it. I won a copy on Rachel's blog so I can't wait to experience it for myself. I for some reason couldn't get into Breathe but it's such a shame you were disappointed with the sequel. Great Reviews Sophie! Love the new system. Amber is brilliant! I'm sure you'll love it just as much as I did! I loved Breathe, sorry to hear you couldn't get into it, especially since it's one of my favourites! Thanks, Sunny! The new rating system is all down to Amber's awesomeness! Fab reviews! I haven't read Resist but I've read Amber and it's AMAZING <3 I'm glad you enjoyed it! Thank you, Amber! IT IS AMAZING - with the best title as well right? I understand what you mean - sorry you didn't like it! I wish there was another book, even though I wasn't a huge fan of Resist, I'm going to miss the characters! Thanks! 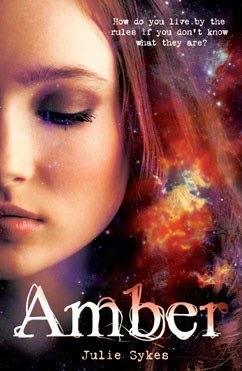 I need to read Amber soon! It looks amazing! Really glad you enjoyed it. I don't ink it's Julie Sykes' debut novel though. BREATHE IS AMAZING! One of my favourite books - hopefully you'll be able to enjoy it! You're right - it's not her debut! Thanks for the tip, Jack; will definitely edit! It's her debut YA novel. Thank you!